The Monk Gerasim, First Vologda Wonderworker, accepted monastic tonsure on the day of 4 March at the Kiev Gniletsk Uspenie monastery, having been attracted to the place of the caves, where the Monk Theodosii (Feodosii, Comm. 3 May) secluded himself during the time of Great Lent. Out of obedience to the brethren, the Monk Gerasim accepted the dignity of priestmonk. In imitation of the exploits of the fathers of old, the monk felt the pull to Northern Rus' and he arrived at the River Vologda (19 August 1147), on the right bank of which he blessed the emerging settlement, "foretelling that here would be a great city". The saint chose for his dwelling place the dense virgin forest, separated from the settlement by the not large Kaisarova creek. There the monk built himself an hut and in the tranquil solitude he gave himself over to contemplation of God, unceasing prayer and work. 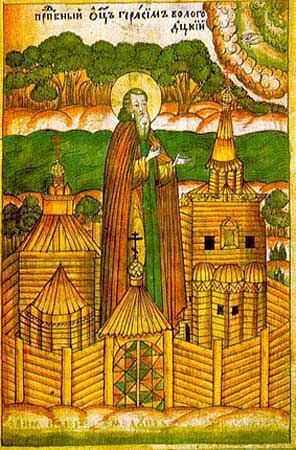 He built a church in the Name of the MostHoly Trinity, and under him there came to be the first monastery in the North, named for the MostHoly Trinity. The monastery served in the spiritual enlightening of the surrounding peoples. The monk reposed peacefully to the Lord on 4 March 1178, on the same day as his monastic tonsure and his monastic name-day in common with the Monk Gerasimos.